The Epic 450 MX treadmill is made by ICON Fitness, the top selling company that also makes Proform, Reebok, Image, Weslo, and NordicTrack machines. It’s comes with a tough little motor, along with basic (but challenging) programs, wireless HR monitoring, and a fold up design. The only thing it lacks is a competitive price. The Epic 450 MX treadmill has a bright ClearView™ console that displays time, distance, speed, incline, and calories burned. You can set the unit to manual, or try one of the programs; just select one of the six personal trainer designed workouts and the machine will automatically adjust the speed and incline to keep you in a target heart rate zone, or give you a challenging aerobic run, or help you with your weight loss goals. UPDATE: EPIC treadmills are no longer being manufactured or sold. 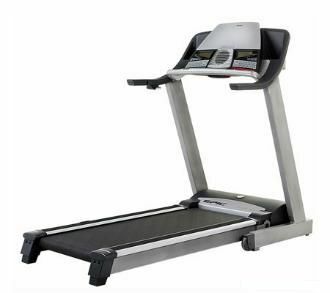 Check out our NordicTrack treadmill reviews to find a comparable model. Experts continue to be impressed by the improved quality and care that ICON Fitness is putting into the new line of Epic treadmills. These machines are built with many of the same components as those found in models such as NordicTrack, yet the overall value is still questionable. Epic treadmills are designed and built for the mass market and offer just enough snazzy features (built-in fan, deck cushioning, 10% incline) to lure customers to buy them online and at Costco. The Epic MX 450 is a decent machine; but it offers nothing to make it stand out from the crowded field. Customers who have bought the Epic 450MX treadmill have no serious complaints in their treadmill reviews, but are also quick to point out that they weren’t expecting a lot. The machine will hold up nicely for several years with proper maintenance, average use, and attentive care. As an entry level unit, it will get the job done. Generally priced (when on sale) from $999 to $1,299, the Epic 450 MX offers “just okay” value, even if you can find it at the lower price. The belt is shorter than other competitor models, and the 2.25 CHP motor is no great shakes -- NordicTrack has a couple of models that come with 3.0 CHP motors at this price, and the NordicTrack T7 si treadmill has the identical specs to the Epic 450, but sells for $799. If you can find the Epic 450 MX treadmill for around $900 or less, it’s a good deal, but we still prefer the style, reputation, and value of the NordicTracks.